- Custom leather agitation muzzles. My guys has 2 because they're THAT awesome. He has yet to chip off the paint through some heavy work and they are his FAVORITE muzzles. Seriously. He shoves his head right into them. - Custom leather collars. To match your custom muzzle! Or anything else you want. - INSANELY awesome biothane leashes with a new clip. Gone are the old clip clasps and they have a new clasp that has almost 0 chance of accidentally breaking or coming apart. In layman's terms it functions like a keychain: you slide the D ring of the collar between two rings, so it creates a chain. There's nowhere for the clip to break, slide out, or snap. A friend absolutely LOVES this type of mechanism on leashes more than alligator clips. And I adore biothane because it's AWESOME. - Colored fur savers and prong collars. Oh yeah. Lime green, gold, beautiful sky blue, hot pink, and about most any other color you can think of. - Glow in the dark "do not pet" patches for harnesses. - Scent boxes. If anyone wants to do scent games or searches/tracking, these are AMAZING. They are magnetic so can stick to anything metal, as well as being made of metal so they don't absorb any odor and can be washed out easily. I pop in a few chunks of chicken and hide it around the house as part of hide and seek. My guy has yet to break it, even after his intense game of "this is my new ball" game he played with it. One friend uses it for a sort of SAR/tracking game she plays in the woods with her dog. These guys truly get working dogs, high drive dogs, and any dog that's super strong. They don't mess around with quality. Every single thing I've ever ordered from them has been super high quality and built to stand the abuse our striped beasts can dish out. I will admit I have like half the things on their site. Thor does lots of searches during the week, and my creativity has been waning...but the magnetic search boxes gave me the idea to make my own with a lidded metal tin and snips off a roll of magnetic tape that's been in a drawer doing nothing. I've needed something to new to challenge Thor's searches. Yea! 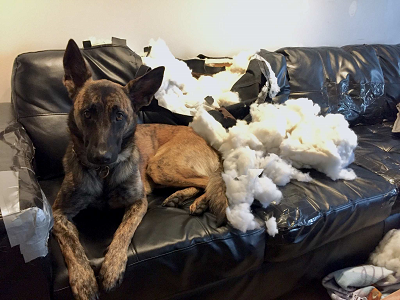 Tell us about yourself: I am a long time dog enthusiast but first time Dutch Shepherd owner. Logan is a KNPV bred Dutch Shepherd and great grandson of the great Arko Kikkert. He's by far the most demanding dog I've ever had but also by far the most rewarding. I've bought a custom painted collar & muzzle from Working Dog Dry Goods and we are extremely happy with both. These guys are great!!! Tell us about yourself: Picking up my Dutch puppy on 30 June. So funny. I was doing a bit of google analytic work this morning on the website and this popped up. I'm a co-owner here at working dog dry goods. I love seeing positive feedback from our customers. We're a small operation. It's just Alesha, my self, Static the Dutch and Lech the Malinois. We've grown a lot in two years and have tons of projects in the fire right now. We love being able to get up every morning and do what we do and you guys make it possible. Thanks!